We try to display as accurate as possible, however color may slightly differ due to lighting. 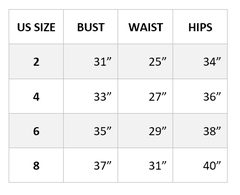 For sizing, please refer to the following guide. If you have any questions about fit, we welcome you to call, DM or email us. Our fashion consultants know our dresses inside out and are happy to help assure you order the best size.